Confession: I missed my daughter's first IEP meeting. To me, this was akin to missing her first smile, her first steps, or her first day of school. Somehow, I managed to get the date and time flip-flopped. Instead of the 8th at 10 am, I thought the meeting was the 10th at 8 am. As a mother, I felt extremely guilty when the school called me to remind me of my error. As a teacher, I felt incredibly embarrassed. I have sat in plenty of IEP meetings in my 8 years as an educator. I know firsthand how much planning, preparation and time it takes to conduct them. I have been there when parents have no showed. I've heard the sighs and the under-the-breath comments when -- after a phone call -- a parent cannot be reached. And I've seen the frustration when a parent never comes. But the other day, I was that parent. After the initial, "OMG! 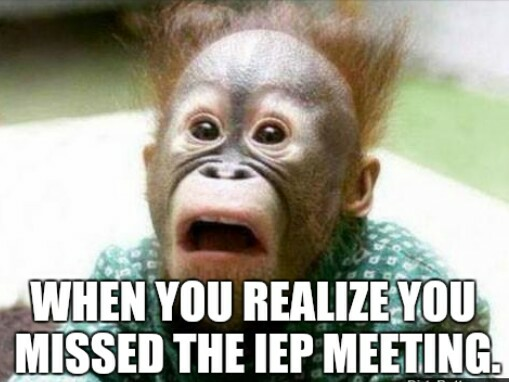 I missed my kid's IEP meeting" shock wore off, I realized one important truth: I am not the first parent to miss an IEP meeting, and I will not be the last. However, with a bit of reflection and planning and a whole lot of advice from fellow moms, I am prepared to be prompt and present for the next one. 1. Purchase a nice planner. In my twenties, my memory served me well. However, as I slowly inch closer and closer to 40, my memory sometimes leads me astray. Having a planner will not only help with the occasional IEP scheduling, but it will also help with the scheduling of many doctor's appointment, therapy sessions, and maybe even little me time too. Mimosas anyone? 2. Call to confirm. Had I done this, I would have saved myself a lot of guilt and embarrassment, and I would have been able to actively participate in the decisions that were made for my daughter. While you're school district may give you a courtesy reminder call, many do not. In fact, sometimes all you will receive is a letter a month before the meeting as a reminder. If your memory is anything like mine -- see #1 -- then calling to confirm is a great way to make sure you have the time, date and place correct. 3. Have the number of the school or the Special Education Department on hand. Sometimes life happens, and there is nothing that you can do about it. Babies get sick, cars won't start, MapQuest fails you. If you know you will be unable to attend ahead of time, call the school; they may be able to reschedule so you can participate. If that doesn't work, the school may be accommodating enough to allow you to participate via phone conference. Both are better options than not being able to participate at all. 4. Have your paperwork organized in one central location. Anything from doctor's reports to therapy session paperwork is beneficial. Ensuring all of these important documents are in one place will save you time and energy the day of the meeting. If you haven't noticed organization is truly key. Hint: If you choose to keep the paperwork in a super special and super secret place, make sure you know where that place is. I learned that lesson the hard way. 5. Allow yourself to make mistakes, and then, forgive yourself. No one can deny that part of parenting is making mistakes. The key is to learn from them and move forward. Believe me, if to err is human, then I'm about as human as they come, and it's okay if you are too. This is so funny And true! It's always good to be in good company!